Tomorrow People: What are the stupid laws of teleporting? 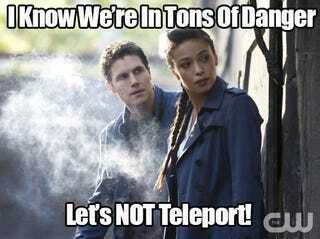 What exactly are the laws of teleportation on The Tomorrow People? Because in the latest episode, "Kill Switch," Stephen and Cara half-use it in a way that puts them in danger and gets them hurt. It's kinda stupid. The show has established that a tomorrow person can teleport all over the place, seemingly anywhere at will, and can take someone with them by grabbing them. In this episode, Stephen and Cara go to the Long Lake Dam out in the Adirondack Mountains, and there are stopped by two gun-toting soldiers. They teleport out of the way of the guns to behind the soldiers and then start a fight. But then they fight and fight, and fight and fight and fight, which attracts more soldier attention, and a bullet grazes Cara's shoulder (which seems fine later on in the episode during the indie-music montage). Why? Why bother with that fight at all? If you're close enough to punch the soldier, you're close enough to grab him, and then just teleport someplace else, let go of the guy, teleport back. Done and dusted — you don't attract any attention or draw any fire and you get what you came for with less hassle. Is it really that simple and they're just dumb, or am I missing something about the laws of teleportation in The Tomorrow People universe? Is one of the laws that it only applies when the plot requires it?